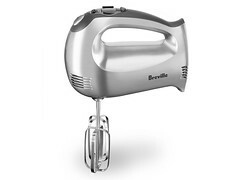 The Breville Handy Mix Digital™ — with digital count-up timer for precise mixing times to prevent under and over mixing. C. Stainless Steel flat Beaters. F. ‘ON/Off’ Switch. G. ‘Decrease Speed’ Button. 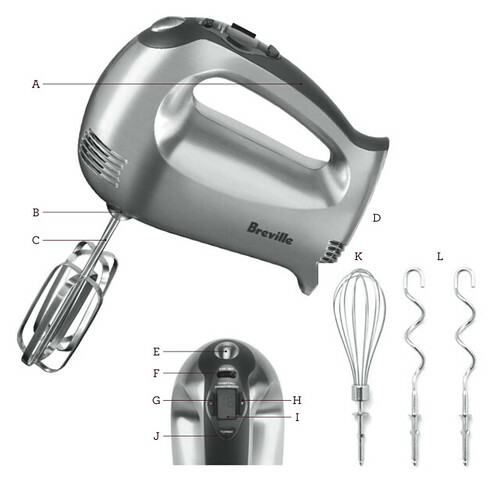 K. Stainless Steel Wire Whisk. L. Stainless Steel Dough Hooks.